Wharfedale, UK -- A Buddhist centre which runs meditation classes in Wharfedale is inviting people to visit its workshops and events in Keighley. The Buddha Land Meditation Centre and the World Peace Community Cafe, Lawkholme Crescent, Keighley, has recently undergone refurbishment by its volunteers. Run by volunteers for the benefit and welfare of the community, it is open to people from all backgrounds and beliefs who want to learn to meditate and, if they wish, to understand more about Buddhism. The centre is fortunate to have a very inspiring and dedicated resident teacher in Gen Kelsang Paljin, much loved by his students for his skillful teachings and warmth. Meditation classes, half and full day workshops are held in the meditation room on the first floor. 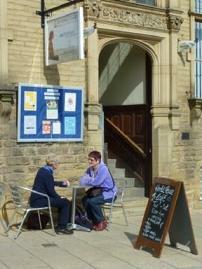 The centre runs regular evening classes in neighbouring communities, including The Friends Meeting House, Queens Road, Ilkley. It also provides public services such as school visits, speakers for groups or societies wishing to learn more about Buddhism, and chaplaincy. Other regular activities include Stop the Week, a monthly evening meal with internationally themed cuisine, and a monthly walk for World Peace, held on a Sunday. The centre has a community room and World Peace Cafe, established in 2010. Visit enjoymeditation.org for more information.